Situated in the Snowdonia National Park Arran and Cader are two spacious, attractive, comfortable properties with stunning views of Cader idris and Wnion river on their door steps. The two cottages lie within easy driving distance of many enjoyable activities including mounting biking, white water rafting, riding, quad biking, fishing and many excellent walking including the famous Torrent Walk that passes only a few hundred metres from the cottages. The two cottages recently converted cottages furnished to a good standard with original oak beams. 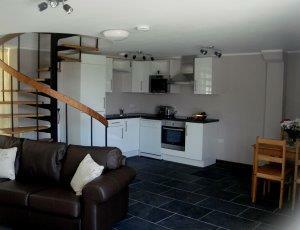 Arran cottage with large bedroom that can sleeps 3 people. With either 3 single beds or a king size and a single bed. Cader cottage with two en suite bedrooms, one being a double and the other a twin bedroom. Both cottages have a fully equipped kitchen, digital free view TV with DVD player, smoked detectors and fire extinguishers. All bedding, linen, some towels, tea towels, heating are included in the price. The cottages have large outside seating patios with table and chair perfect in the summer to have your breakfast outside and take in the beautiful views. They also have secure gardens for the children to play and private parking right outside the property. •	Large mountain bike storage. •	Bikes wash on site. •	Drying room on site. •	Laundry room on site. The grid shows the prices and daily availability from Sat 20 Apr 19 to Sat 27 Apr 19. It's easy to check availability for particular dates; just use the calendar to choose the check in date, select the number of nights and click the 'Search' button. Click the Book Now or Book Direct button to book the highlighted days. With Book Now the unit booking will be confirmed immediately, with Book Direct the unit reservation will be confirmed within 24 hours.. Washing and drying facilities onsite at extra cost. Children welcome from any age. Situated just off the A470 near to the Starbucks just 1 mile away from historic town Dolgellau. See directions for Dolgun Uchaf LL40 2AB. Any problem call us for directions.